Download Your Free Guide to Drawing Anatomy Today! Human anatomy is a complex subject and the extraordinary construction of the human body is celebrated prominently in art throughout history and today. Knowledge of the human body can be an invaluable tool for artists, as long as anatomy drawings are approached in the right way. The question most often heard among artists isn’t as much “Why should I draw anatomy sketches?”, as it is, “How do you study anatomy?”. With Artist Network’s free art lessons on drawing anatomy, learn how you can streamline your studies into a more rewarding and manageable process by utilizing the right resources and by first concentrating on the bones rather than spending hours memorizing the names and shapes of muscles. Studying for anatomy drawing is a never-ending process. The more you know about the subject, the more you’ll discover what you don’t know, and the more you will want to know. Enhance your awareness of subtlety and structure of the human body and learn how to draw a human that displays intricate detail and complex structure. Download your free guide today to discover where to go and whose teachings to value when it comes to the art side of anatomy. Learn what the artistic purpose of anatomy is all about in this free tutorial. As an artist trying to understand the structure of the human body’s forms, you are more likely to retain and absorb the information if you refer to the text as you draw from the diagrams, consciously asking yourself what function each muscle or muscle group serves, where it begins, and where it ends. If you’ve been seeking a free body drawing art lesson, let this free guide from Artists Network be your first step in mastering the skill of drawing the human body and master skills for hand drawing. When drawing anatomy, try to visualize the basic form concepts underlying the figure built upon tapering cylinders as in the limbs; boxy tubular forms as in the pelvis and chest; and spheres as in the head, breasts, and many other smaller sub-forms that are often combination half-spheres and half-cylinders, such as the biceps, stomach mass, or buttocks. You’ll have an expert guide handy for exploring the complexity involved in drawing human body features that are representative of a muscle’s full function, volume, and structure. Learn tips on how to draw hands and other ways of approaching your studies better so as not to overwhelm yourself to the point of giving up. 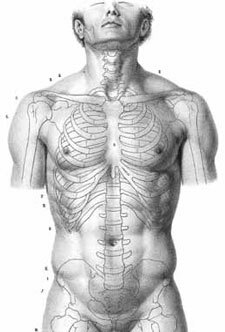 As the great anatomy teacher Robert Beverly Hale often noted, drawing human anatomy is the “scientific” side of art, meant as a tool to help you understand the model’s volumetric nature and find subtle visual details you might otherwise miss. The differences between male and female bodies range from the obvious to the very subtle, and knowledge of these details can lead us to more informed, realistic figure drawings. This free sketch lesson plan will help you discover the benefits of drawing female anatomy as well as male and give you steps to take to make your studies rewarding and manageable. Author Dan Gheno discusses resources he’s used for drawing anatomy, plus methods of practice that will allow you to integrate it into your art in ways that make sense and aren’t a hindrance to what you want to do. That includes what to focus on when you are life sketching, why sculptural écorchés are so helpful to artists, and what Old Master anatomy drawings are worth a good, long look. Gheno reminds us that studying anatomy as artists should be a systematic enterprise. Start with the bones. Then muscles can start to make sense. Learn the form and function of each muscle group and pursue them as groups or pairs so that you understand how these parts work together. Many artists studying to learn how to draw human figures know that there are a number of resources available to help pursue their studies, including books, videos, lectures, and sculptural approaches. And of course, there’s also the way Old Masters learned anatomy—through dissections. With this free eBook as your guide, learn the best ways to approach the various resources available and select a method that works for you in your studies.